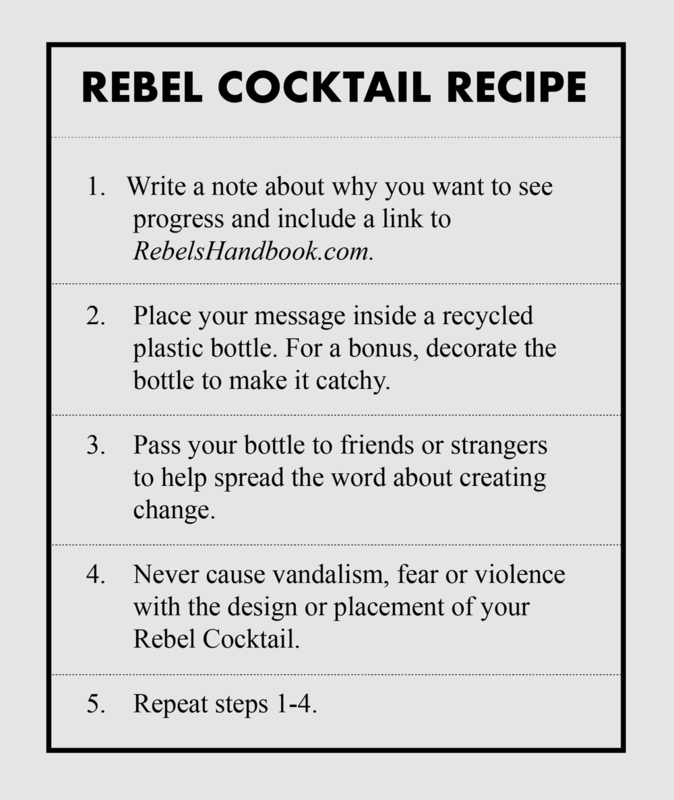 Improving our status quo requires spreading words of change far and wide with Rebel Cocktails. The Rebel Cocktail is a revamped classic from the rebel’s arsenal: the Molotov Cocktail. But instead of filling the Rebel Cocktail with gasoline, we rebels should understand that words themselves can be more explosive. Spreading the word is simple: place a note about why want to see progress and include a link RebelsHandbook.com inside a recycled bottle. Next, launch your Rebel Cocktail far and wide (figuratively speaking). You can pass it to a friend or a stranger. The more cocktails you throw, the more our rebel ranks can grow. But please place the Rebel Cocktails strategically instead of breaking glass – nowhere in the rebel struggle do we advocate for violence or vandalism. To the culprits of today’s social ills – be warned. Because if enough Rebel Cocktails are handed out, the rebel fight holds the potential to become an unstoppable force toward social change. Since messages can be passed along anonymously, rebels can circumvent traditional confines of reprimand or censorship. And because we’re using recycled bottles, our arsenal is endless and sustainable. Social change awaits for all those that dare to seek it.